Freshman guard Maddie Loder goes up for a basket during a game against Villanova last month. Women’s basketball put on its best defensive showing of the season Tuesday to help kick off the new year with a victory at home. GW (3–10) held Memphis (5–8) to just 24.0 percent shooting en route to a 51–38 win in the only Division I women’s basketball game played on New Year’s Day Tuesday. The win ended the Colonials’ five-game losing streak and leaves GW heading into conference play off a victory. The Tigers’ score is the lowest total GW has held an opponent to so far this season. But both teams struggled on the defensive end and despite the Colonials’ victory, they made just 30.5 percent of their own field goal attempts. Both teams finished 10-for-17 from the charity stripe, an area where GW has struggled all season. A new three-guard starting lineup featured freshman guard Maddie Loder making her first career start and redshirt sophomore forward Olivia Gumbs making her first start in a GW uniform. Loder and Gumbs replaced redshirt sophomore forward Sarah Overcash and sophomore forward Neila Luma in the starting five. Rizzotti said having Overcash and Luma as instant offense off the bench gave her confidence that the team’s production would not decrease when the second unit came in. With new rotations in place, Rizzotti went deep into her bench and received contributions from everyone in the balanced effort. All 10 players who saw the court scored in the contest, led by Luma, who nearly missed a double-double off the bench with nine points, nine rebounds, two blocks and two steals. The Colonials held the Tigers to just 17.4 percent from distance on 4-for-23 shooting and forced 12 first-half turnovers. Rizzotti said her team’s defensive game plan was to force outside shots and pack the paint against the Tigers, who are one of the best offensive rebounding teams in the American Athletic Conference. The result was a 48-38 edge for GW on the glass, including an 18–10 advantage on the offensive glass. Luma, Overcash and senior forward Kelsi Mahoney gave the Colonials 11 second-chance opportunities, which they converted into 12 second-chance points. The Colonials also held Memphis sophomore forward Alana Davis, the team’s leading rebounder, to a below-average game with eight rebounds and eight points in the match. Freshman guard Jamirah Shutes led the Tigers with nine points and six rebounds. Both teams went point-for-point in the opening minutes of the first quarter. Senior guard Mei-Lyn Bautista knocked in a layup to kick off GW’s scoring before Memphis hit back with a three-point shot of its own. 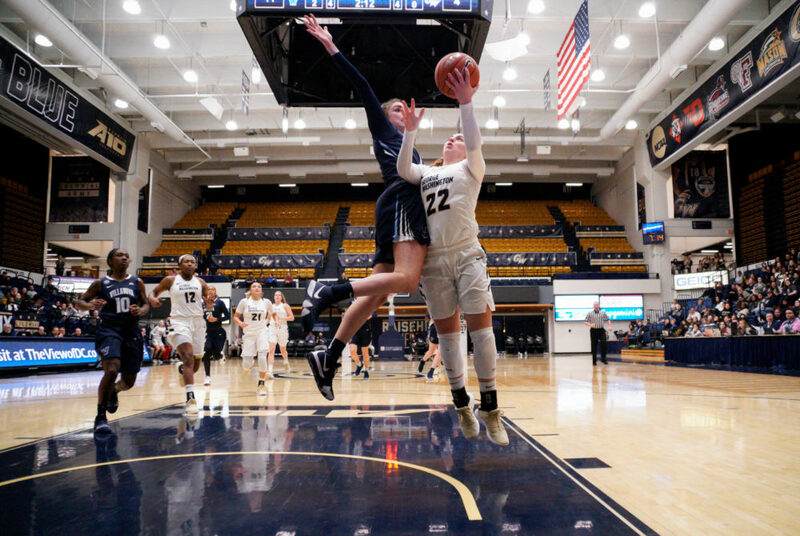 A three-pointer by senior guard Anna Savino gave GW a 7–3 lead with 6:11 left in the frame, but ended up being the team’s final field goal of the quarter. Memphis caught up to the Colonials during their scoring drought and tied the game 7–7 before a free throw by freshman center Kayla Mokwuah gave GW a slight 8–7 advantage heading into the second quarter. The Colonials held the Tigers scoreless for the final 5:14 of the first quarter and the two teams combined to shoot 6-for-27 in a tough opening frame. GW replicated its defensive effort in the second quarter and once again held Memphis without a field goal for more than five minutes. The Colonials allowed only eight shot attempts on 16 possessions in the period. A three-point shot by sophomore guard Lexus Levy boosted GW’s lead 16–9 with about seven minutes remaining, but four unanswered points by the Tigers cut the Colonials’ lead to three points 16–13. The Colonials grew their lead to nine points 22–13 but the Tigers crept back into the game in the final minute of the frame. GW went into the half up 22–16 and shooting 26.7 percent from the field on 8-for-30 shooting. Shutes drained a three-point shot to open the third quarter, but a 6–0 run powered by Mahoney and Bautista padded the Colonials’ lead 28–19. Both teams traded baskets for the remainder of the quarter, and key free throws by Davis kept the Tigers competitive. GW carried a 36–29 lead heading into the final 10 minutes of play. The Colonials completely shut out the Tigers in the fourth quarter, allowing them to secure the win. Memphis went 2-for-16 from the field in the quarter, allowing the Colonials to build a double-digit lead. Another three by Mahoney grew GW’s lead 41–29 in the opening three minutes of play, and the Tigers never got within more than seven points of the Colonials for the remainder of the game. GW will host the Atlantic 10-leading Fordham Rams (9–5) to kick off conference play Saturday at 11 a.m.